Use the form below to inquire about CGH Traditional Resort at Kumbakonam . Use the form below to reserve for CGH Traditional Resort at Kumbakonam . The cottage has a double bed and a private sit out. Enjoy a rejuvenating retreat in nature’s lap at Mantra Veppathur – CGH Traditional Resort at Kumbakonam. Mantra Veppathur- CGH Traditional Resort at Kumbakonam is a traditional, eco-friendly resort situated at Tanjore (also known as Thanjavur). Built around a unique concept, the architecture and activities of the property give heavy emphasis to the elements of faith, spirituality, and traditional values. Healthy well-being and relaxation are the two main ideas that the retreat swears by. Mantra Veppathur-CGH Traditional Resort at Kumbakonam is spread across acres of land, by the banks of the rivers Veerachola and Cauvery. While you are at the property, you cannot miss the quintessential Tamil look and feel the property radiates from every nook and corner. The location of this resort makes it more adventurous. Hop on to the dedicated bridge that leads to the beautiful, resort. Wake up to the freshness of the clean, pure air, the gurgling of waters flowing in the tranquil river, the sight of colorful butterflies, gorgeous panoramic views, the songs of birds, and lush foliage all around you. Nothing short of pure bliss, isn’t it? Soaked in tradition, Mantra Veppathur-CGH Traditional Resort at Kumbakonam exudes spiritualism while imparting the feel of an agraharam (the typical street of Brahmin residents). With its aesthetics in place, the well-structured layout with its herbal garden, holy trees, and flowers only scream beauty at every corner. 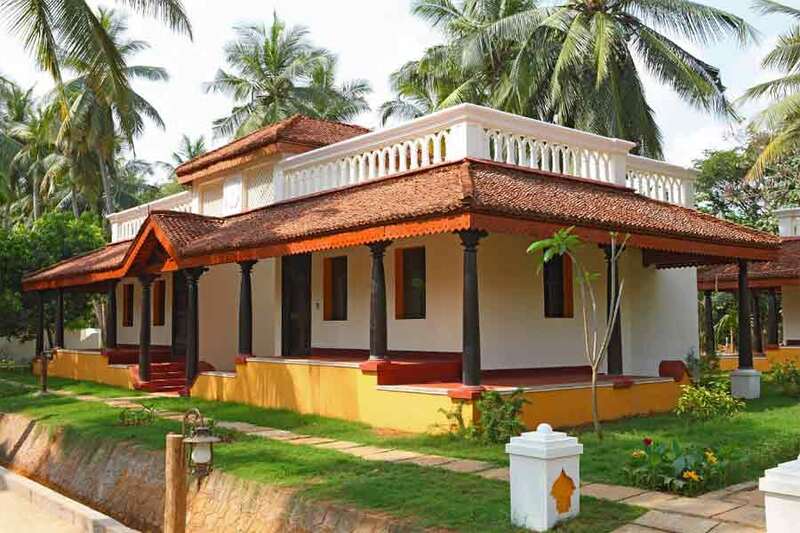 The resort has three room categories, namely Mantra Cottage, Mantra Illam, and Mantra Panaiyar Illam. All these rooms are traditionally built and may look rustic outside, but they contain every modern facility you need for a comfortable stay such as Wi-Fi access, power back-up, and in-house laundry. Where there is a dash of tradition, there ought to be an ethnic kitchen filled with traditional flavors. Just like a regular Tamil household, the food here is cooked in a traditional way. The Mantra Veppathur- CGH Traditional Resort at Kumbakonam has an ethnic kitchen named Anna Prakshana which serves healthy, vegetarian meals. The food here is cooked using spices and condiments, based on recipes that are handed down from one generation to another. While coconut oil is the medium of cooking, tamarind and asafoetida are some of the important ingredients used in these lip-smacking dishes. If you ever harbored an idea that vegetarian food cannot be delectable, the dishes coming from this ethnic kitchen will change that notion forever. Indulge in massages, cleansing treatments, Ayurveda and more at the exotic wellness spa overlooking the river, take up yoga sessions or enjoy the in-house facilities of the property. Refresh your soul and revitalize your body while you spend your holidays at Mantra Veppathur-CGH Traditional Resort at Kumbakonam. You can also visit the nearby temples and soak in the culture and art, glimpses of which you see all around the property as well. At Mantra Veppathur, the time for check-in 2 PM and the time for check-out is 11 AM. Extra children (5 years and above) and adults in a room will be charged additional occupancy charges per night. In a room, only one extra person above 5 years can be accommodated. The availability of some of the activities, whether they are part of the package or chargeable, is subject to change due to external factors. Travel guides can be arranged based only on their availability and you need to pay them directly. Charges for the folklore varied based on the number of people attending the show. At Mantra Veppathur, you can avail the services of bonafide tour leaders. If you are part of a group with more than 9 and less than 15 full-paying members, you are eligible to get a 50% discount on tour leaders. If your group consists of 15 full-paying members or more, you can avail bonafide tour leaders at no additional cost. You can choose to cancel your confirmed booking or reduce the number of rooms. All such cancellations and amendments are chargeable. If you are an individual traveler and cancel your confirmed reservation within 30 to 15 days before the date of check-in, you will be charged a cancellation fee of 50% of the total booking amount. In the case of group inclusive tours, any reduction in the number of rooms within 30 to 15 days prior to the date of check-in will attract a cancellation fee of 50% of the entire stay. Individual travelers who cancel their confirmed booking less than 15 days before the date of check-in will have to pay the entire booking amount as cancellation fee. Likewise, a 100% cancellation fee is applicable for group inclusive tours too if the number of rooms is reduced less than 15 days prior to the date of check-in. One can never run out of things to do in this property. In order to release stress and rejuvenate, book an appointment at the spa for a relaxing massage and other wellness treatments. The exotic spa overlooks the river and offers an aromatic herbal bath as well. You can also take up some sessions of yoga under expert guidance at the yoga and meditation center. Those who want to experience life in a rural way can go for a bullock cart ride through the village. If you prefer spending your time learning something new, sign up for a pottery demonstration. Travel guides are available at additional charges for a day, so you can hire one and head out to explore places and tourist attractions close to the resort. You can also ask for a folklore show or a performance of Bharatanatyam to be arranged at additional charges. For those interested in exploring the rural ways, take up some rural activities to understand the culture, dance, and music of the local inhabitants. If you happen to be at the resort during Pongal (a festival celebrated by the people of Tamil Nadu), take part in some festive activities where locals gather to celebrate it together and cook dishes in clay pots. Be a spectator of some famous martial art forms like silambattam which involves stick fighting and gusthi or kai kuthu sandia that is a form of boxing. Besides these, you can also witness kabaddi, a game of holding your breath and chasing one another, and uriyadi or smashing the colorful pot during certain festivals. Those who like to take it a little easy and enjoy the in-house facilities could use the swimming pool, get an Ayurvedic treatment done, or simply enjoy the air of spirituality. You could also venture out a little to take up a rural walk to understand the culture, nature walk to watch birds like peacock, kingfisher, swift, purple-rumped sunbird etc. and mammals like squirrel, mongoose, flying fox etc., or check out the cultural entertainment in store for you such as an evening of classical music, dance and fine arts. The closest international airport is Tiruchirappalli (Trichy) International Airport, about 110 km away from the property. Chennai International Airport, which is at 265 km, is another option for those flying down to Tamil Nadu. Coimbatore International Airport is about 360 km and Kempegowda International Airport at Bangalore is at 442 km away from this traditional resort. Train enthusiasts can board a train to Kumbakonam Railway Station, which is about located about 10 km from the property. Thanjavur Junction, located 50 km away, is another alternative for travelers who prefer train journeys. The railway station at Trichy is located at a distance of about 110 km from the property. Those who like to drive, please note the property is situated at a distance of 270 km from Chennai and 414 km from Bangalore. Some of the nearby towns and tourist attractions include Thanjavur (50 km), Chidambaram (70 km), Nagapattinam (75 km), and Pondicherry (126 km).